With close to two decades on the market, serving all types of players, the Wilson Hyper Hammer Tennis Racket definitely has a story to tell. It feels very light in the hand, and gives a lot of maneuverability, making it great for beginners. On the same note, the head size gives a wonderful sweetspot, and even more seasoned players should find it worth their while (and money, of course). Wilson Hyper Hammer 5.3 Strung Tennis Racket Strengths: The Wilson Hyper Hammer features a light frame and a lot of power in a small package. Overall: The Hyper Hammer is perfect for any beginner or intermediate player seeking power + control in a racket. I know that there are folks out there who might see it and think it’s a nice entry-level racquet, and nothing else, but trust me when I tell you it’ll give your strokes more power. When I tried it, my serves picked up, and I was able to control the ball a whole lot better. In a way, this is a true tweener, as the community would call it. So, if you’re interested, let’s get right into it. As I said, the very aptly named Hyper Hammer 5.3 provides quite an amount of power, but very controlled power. It really comes into its own with volleys and serves, giving plenty of pop. It’s ideal for beginners or recreational players who don’t generate enough power on their own. On the flipside, if you do have some zest in your swings, then this might cause you to send the ball out and over the line. Players with longer swings who rely on spins will not fully appreciate this racket, as they will find it difficult to hit a topspin or slice. In other words, if you prefer dink shots, you might want to skip out on this one. On the other hand, it’ll favor those with medium to full swings that prefer hitting flat balls, as well as those players who play with short and high backswings and high follow-throughs. Don’t get me wrong, this tennis racket gives excellent control on the topspins, but it makes it hard to generate them. The good thing about this is that it makes you constantly improve your technique and form. One thing, though – the racket needs a dampener because it does transmit a lot of vibrations. A dampener such as this one would be perfect and fit your needs exactly. If you would like to know more about how this racket is structured and how it influences the way it plays, keep on reading. The Hyper Hammer 5.3 sports a 110 size head, which is borderline oversize, making the handle and the shaft seem short-ish. On the flipside, it packs the punch of almost a full 135! While the average racket will come with a 27-inch length, the Hyper Hammer 5.3 will give you an extra half inch (who said size doesn’t matter?). On a more serious note, the extra length of the Hyper Hammer does provide a bit more leverage, as well as better reach than a standard length racket. At the same time, the racket is not too long, so you won’t have to worry about impeded reactions to balls that might hit close to your body. 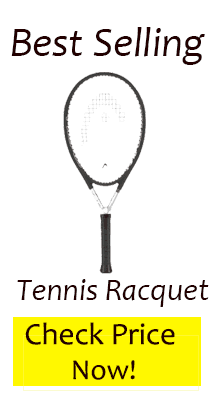 In a word, the racket gives you plenty of maneuverability. Don’t let its nominal weight fool you, because this thing swings heavy for a 9-ounce racket. Of course, it doesn’t quite measure up to a stiffer performance frame, but it comes real close. The weight, together with the slightly oversize head and greater length, places it in what the manufacturers call power or game improvement category. In a nutshell, this type of racket is designed for folks who play short and slow swings to allow them to generate more power. The Hyper Hammer packs a punch with the stability of a heavier head-light racket, but hits with the force of a true head-heavy one. Small wonder as the balance does favor the head slightly (hence the name – Hammer). It’s neither here nor there, though, as the added mass in the head allows the racket to actually shed some overall weight, and without sacrificing the power. Plus, this allows it to keep a slightly larger head, which means bigger hitting zone. Despite the name, the Hyper Hammer doesn’t feel too hammer-y, nor does it come off as overly feathery thanks to the added mass in the hitting zone. It’s highly maneuverable, and should give you just enough help generating that extra power for long shots and aces. The Wilson Hyper Hammer 5.3 comes with a 16×20 string pattern, which, as mentioned before, makes it harder to generate enough topspin. The good news is that this “closed” string pattern will benefit players who prefer hitting flatballs, as well as string breakers. Moreover, the pattern gives better control of the ball, which nicely complements the slightly oversize head on this thing. On the same note, if you would rather have a racquet that allows you to play with more spin and greater rebound, you might want to consider a more “open” pattern (16×19). Keep in mind, though, that this will also mean you’d have to change strings more often. Who Should Buy the Wilson Hyper Hammer? Having the Hyper Hammer in my hands, I can see how it became a long-standing classic, with some many players across the globe having taken to it. Not only does it have more leverage and reach than a standard racket, but it also comes with a larger sweetspot. I’d recommend it to beginner to intermediates, players between 4.0 and 5.0, mostly due to the balance between power and control it brings to the table. If you’re just getting interested in the sport, or coming back after a pause, this puppy should be a nice, lightweight choice for you, with just enough “umpf” to make your opponents re-think their position. Alternatively, if you’re a doubles player, you might like how forgiving it is at the net, not to mention the additional help generating the power for an explosive serve. Whichever way you go about this, keep in mind that this racket is not one of the most popular choices worldwide for no reason.